Citizen's Acquisition of Frederique Constant: Goths at the Gate? Not as sought after as other watches in AP's inventory. Potential of flaws in new movement. We like the watch, but it is not our top choice at that price range. 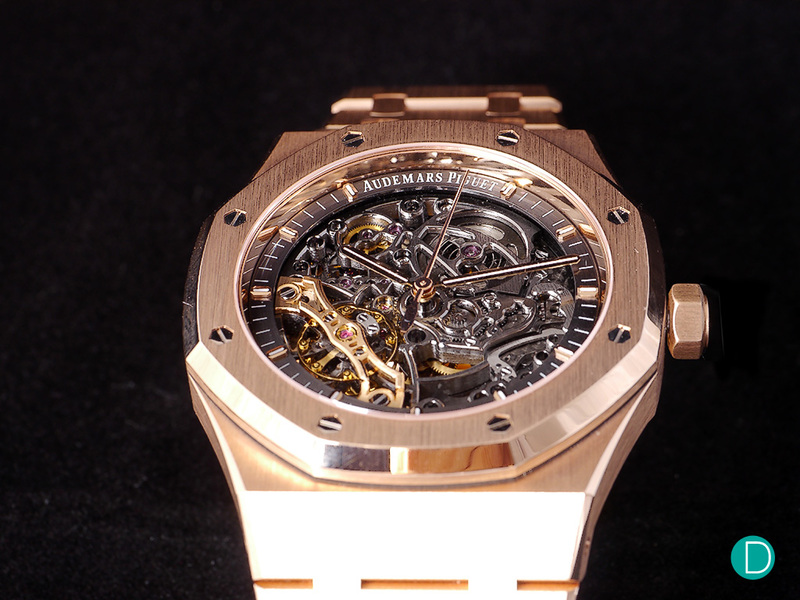 Audemars Piguet revealed the new Royal Oak Double Balance Wheel Openworked at SIHH earlier this year. While retaining the classic Royal Oak case design, the Openworked movement hosts a new concept that is said to improve the accuracy of timekeeping. Two balance wheels are positioned parallel to each other and connected via a central staff. This design is one of its kind and patented by the manufacture. 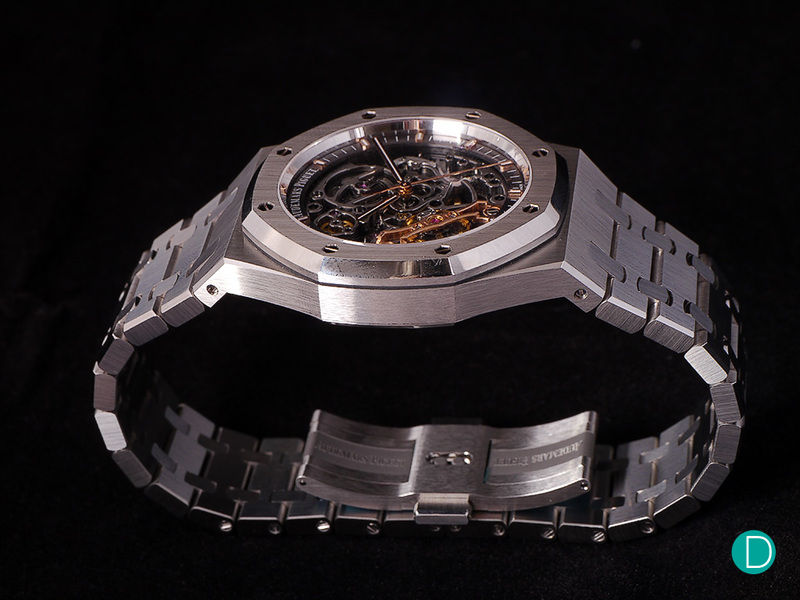 The Audemars Piguet Royal Oak Double Balance Wheel Openworked in steel. What’s so cool about this timepiece? As mentioned earlier, the concept of the new movement. 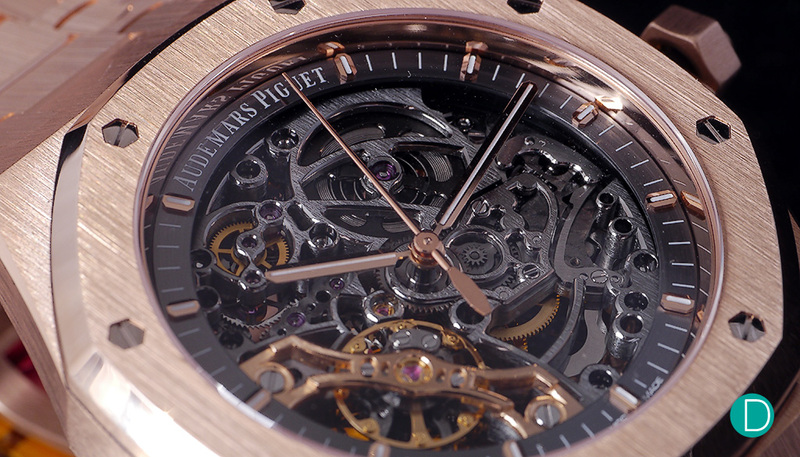 The calibre 3132’s double balance wheel gives more room to improve the precision of the timepiece. The two balance-springs, set on each side of the balance staff, work in opposition and permanently maintain the regulator’s centre of gravity on its axis. 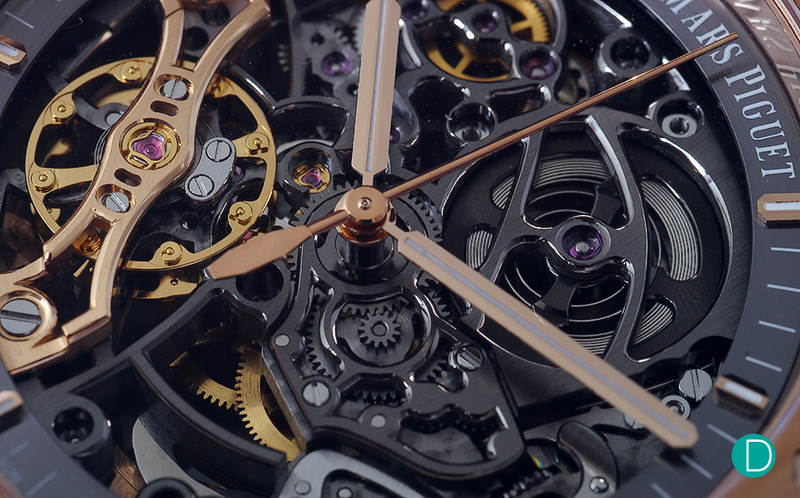 They are connected via a central staff and work up quite a spectacle, almost animating a tourbillon. So how does the watch become more precise with an additional balance? It increases inertia, and with twice the number of inertia blocks on the balance wheels, now 16 instead of 8, there are more setting parameters for the watch to be adjusted. 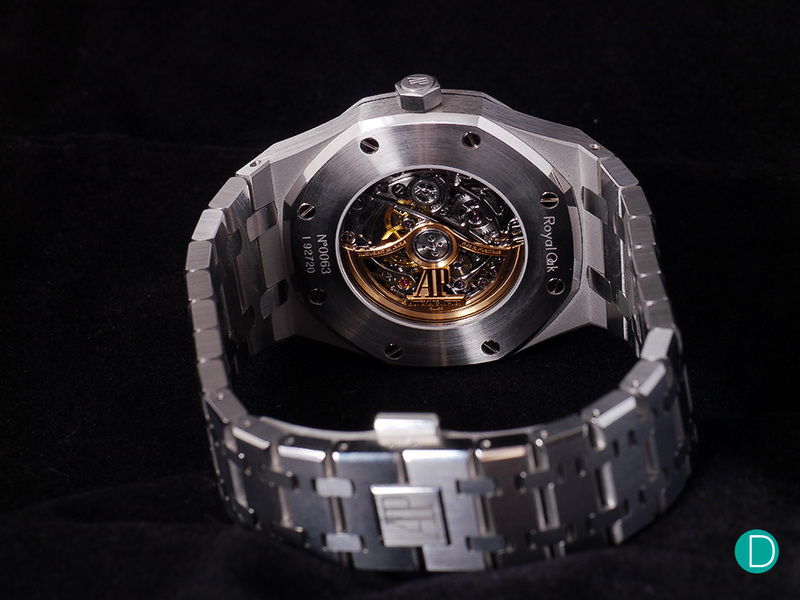 The case measure 41 mm in diameter and 9.9 mm in thickness. 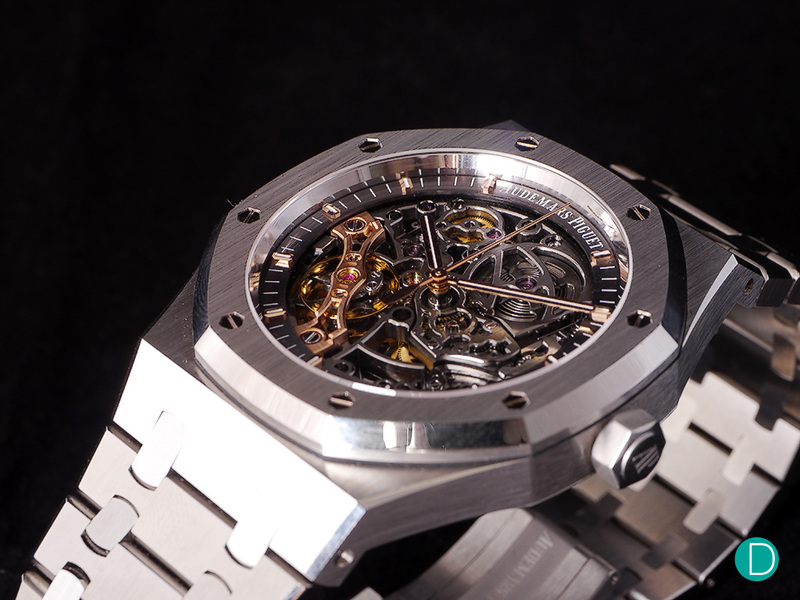 An open caseback reveals the nicely furnished skeleton movement made complete with a cut out rotor. But here’s the catch. It’s a relatively new movement. And just like software updates, the V1 is almost always full of problems. 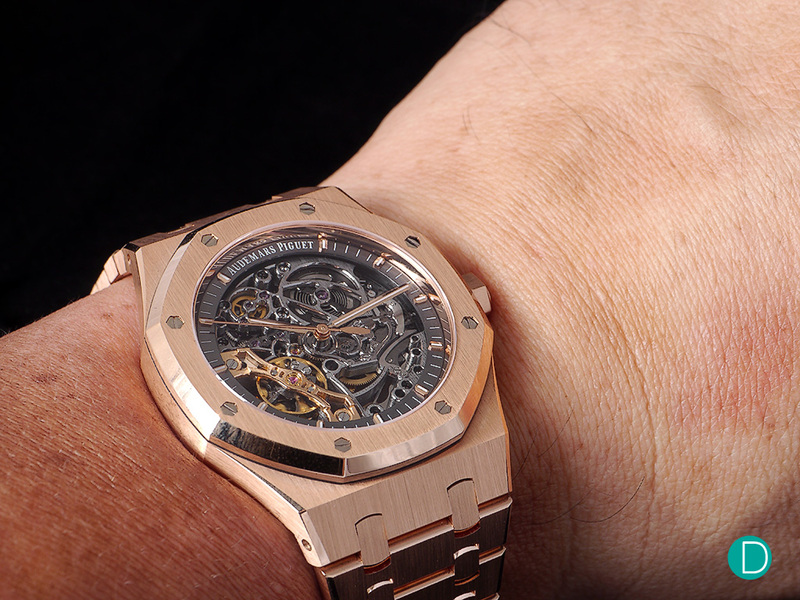 While we are not in a position to say that the movement will fail, we have heard that many collectors run into problems when getting ‘new’ in-house movements. Therefore we advise caution and a degree of risk taking when venturing into new movements. The watch is also available in 18 K pink gold. The skeleton bridges and plates are nicely finished, with the full package of chamfering and dressage. Apart from the innovation with double balance wheels, the watch is pretty much similar to its predecessor. The quality of finishing on the dial is as before top notch, with the complete package of chamfered edges, polish and dressage finishing, mirror polish screw holes etc. Aesthetically, it is in our opinion less subtle, and more vivacious, with the pink gold and yellow gold balance bridge and balance wheel respectively. While understandably, the colour contrasts are to draw the viewers’ attention to the complication, some may find it too overt and tinging on being crass. The dial is a fusion of contrasting colours, pink gold hands and bridges with yellow gold coloured double balance wheel and darkened metal on the bridges. 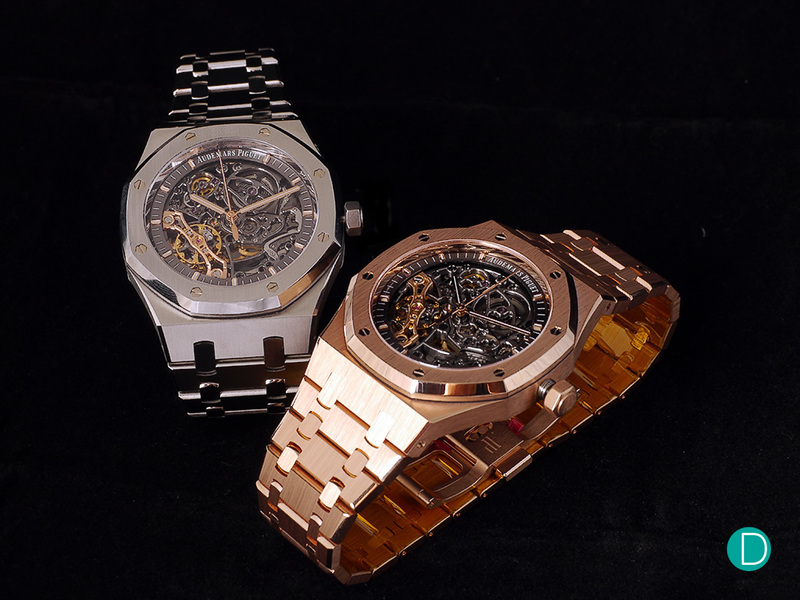 The Audemars Piguet Royal Oak Double Balance Wheel Openworked are available in stainless steel and pink gold. With the latter commanding a premium of more than $30,000 over the steel. The 41 mm watch on the wrist, commands great wrist presence especially when in this metal. While we like the innovation of the movement and the quality of the decoration, we find that the watch is in a challenging price category. The Audemars Piguet Royal Oak Double Balance Wheel Openworked in steel is priced at US$44,100 and in 18k pink gold is US$76,800. At this price range, we find that there are other significant timepieces and complications that a buyer can consider, unless of course he is only looking for skeleton dial watches.